Individually hand knit. Perfect for a little extra warmth on cool days, or layered under coats. 100% acrylic with a soft wool like feel. Machine wash with like colors and lay flat to dry. Imported. (USAF Available in Royal). Minimum order is 6 asst/logo. Made in the U.S. hooded crewneck. Classic athletic gray sweatshirt material. Drawstrings & velcro closure at neck. Reflective striping on hood. High quality soft fleece interior. Full color licensed team logo. Min. order 6 asst. 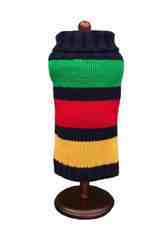 Color Block Dog Sweater Dallas Dogs Ltd.
Acrylic designer sweater. Machine washable. Measure from the base of the neck to the base of the tail. 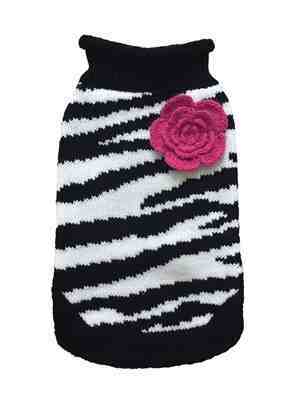 Zebra Fleur Rose Dog Sweater Dallas Dogs Ltd.
Preppy Pup Sweater Collection Dallas Dogs Ltd. Traditional cable knit texture and fun color combinations. Cut for both male and female dogs! Acrylic. Machine Washable. Measure base of neck to base of tail. 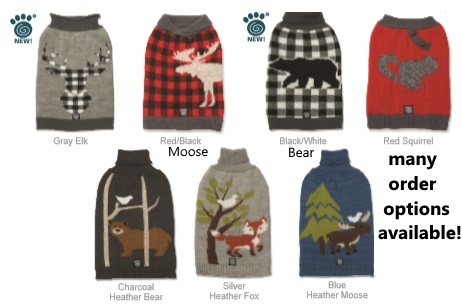 Great sweaters will keep your canine customers COZY! Machine washable and sizes XS-XL. XS-L are sold in case packs of 2. Sweaters without ordering boxes are sold out for the season. Fair Isle Bones Dog Sweater Dallas Dogs Ltd.
100% acrylic sweater. Machine wash and dry. Available in sizes 6"- 16". Measure from the base of the neck to the base of the tail. Fluffier dogs should size up. Snowman and Bone on Board Sweaters Dallas Dogs Ltd.
Look at these wonderful dog sweaters! 100% acrylic sweater. Machine wash and dry. Available in sizes 6"- 16". Measure from the base of the neck to the base of the tail. Fluffier dogs should size up. Handmade Knit wool sweater. 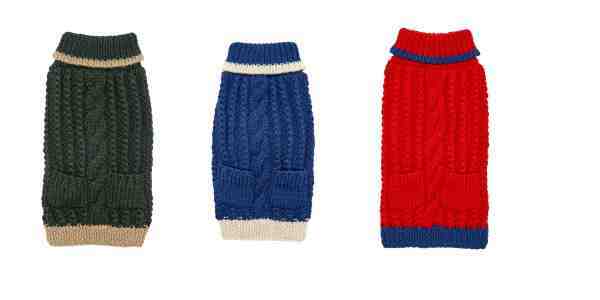 Chilly Dog sweaters are made following the Fair Trade guidelines. All sweaters are handmade & may vary slightly in color & style. 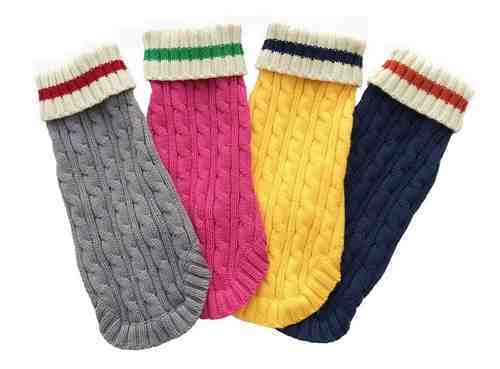 Argyle Dog Sweaters Dallas Dogs Ltd. These argyle sweaters are 100% acrylic and come in sizes 6"-16". Machine washable. Foxy Fox Dog Sweater- 40% off Dallas Dogs Ltd.
Classy and cute....you will love our new " Foxy Fox" sweater. Beautiful colors are brown, cream and reddish orange. These sweaters are 100% acrylic and come in sizes 6"-16". Machine washable. Sweetheart Dog Sweaters Dallas Dogs Ltd.
Our new Red and Pink Sweetheart sweaters will be perfect for your sweetheart! It is pink and white with fluffy yarn hearts. These sweaters are 100% acrylic and come in sizes 6"-16". 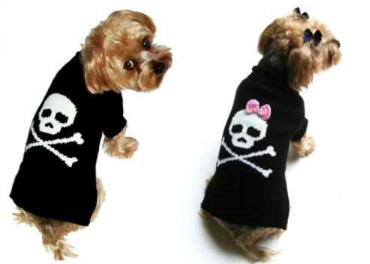 Jolly Roger Sweaters Dallas Dogs Ltd.
Our new matching Jolly Roger sweaters are sure to be a favorite. They are perfect for your edgier customers. A darling knitted pink bow adorns the one "for Her". These acrylic sweaters come in sizes 8" - 16". Machine washable. Warm and cozy sweaters are individually hand knit. 100% acrylic with a wool feel. Machine washable. Available in five sizes. I'm A Star and Aztec Dog Sweaters Dallas Dogs Ltd. 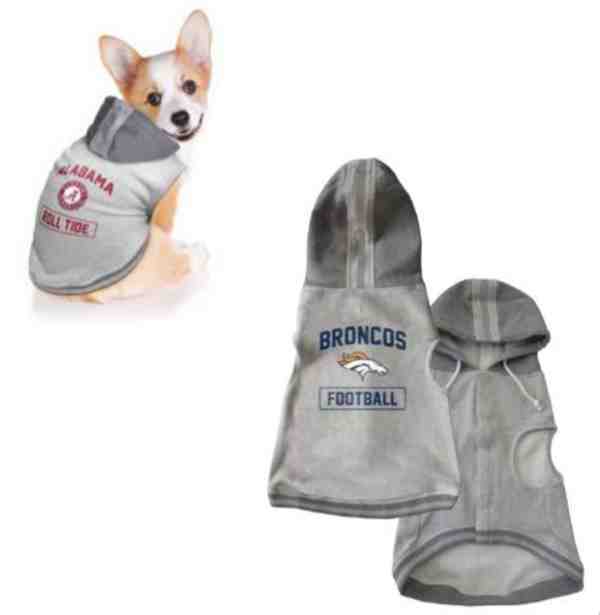 Your pups will be on trend. 100% acrylic, machine washable. View details for sizing information. Cable knit sweater with notched stand collar and contrast patch with embroidered heart. Machine wash cold, tumble dry. 3 colors, XSmall - XLarge. 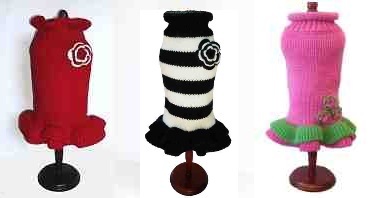 Sweater Dresses Dallas Dogs Ltd. Perfect for the holidays and all season, our sweater dresses have no sleeves and are easy on and off. 100% acrylic and machine washable. For dogs with a little more fluff, go up a size. Pink Hearts and Lovin' Leopard Sweaters Dallas Dogs Ltd. Your pup will look darling in your choice of these pink sweaters. These sweaters come in sizes 6" - 16". We also have the hat and scarf to match! They are machine wash and dry.